Spiegel Grove departs Norfolk, VA.
Spiegel Grove arrives off Key Largo. A diver and a friendly bar jack hover over the bow of the Spiegel Grove at a depth of 80 feet. 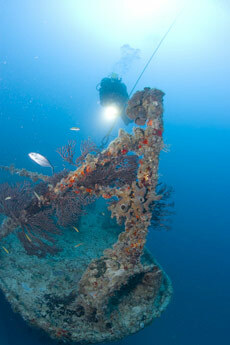 The bow, in its post-hurricane Dennis upright position, is covered with sponges and gorgonia corals. Diver Bob Snyder was the first person to view the wreck of the Spiegel Grove after Hurricane Dennis skirted the Keys in July 2005. Three years earlier, the Key Largo community had rallied to sink the 510-foot retired Navy ship as the backbone of a new reef ecosystem six miles offshore. When Snyder got close enough to see the ship, he couldn't believe his eyes. The storm had turned the 510-foot ship upright from its previous position on its starboard side in 130 feet of water. "I had to ask myself, 'Am I narcked?'" Snyder would later tell a local newspaper reporter, referring to nitrogen imbalance that can sometimes make divers giddy. Snyder and others had learned to love the Spiegel Grove with its cliff-like hull sprawled across the sandy bottom. 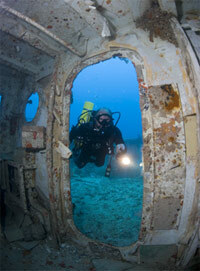 A diver inspects a cabin of the Spiegel Grove in its new, upright position. The ship spent 12 years tethered in the Navy's "Mothball Fleet" in Virginia's James River. In June 2001, it was towed to undergo an elaborate cleaning process and 11 months later was relocated off Key Largo. On May 17, 2002, the Spiegel Grove unexpectedly sank and rolled over about six hours before its intended scuttling. Because of an exceptional safety plan, there were no injuries. Resolve Marine Group finished scuttling the ship on it side June 10, 2002. That's where it stayed until Hurricane Dennis waves helped to finish the job correctly. One thing has not change about the Spiegel Grove in its new position. The ship is enormous and much larger than any natural reef structure in the Keys. In fact, at the time of its sinking, the Spiegel Grove was the largest ship ever intentionally sunk to create a new reef for divers, and it remains one of the largest ships ever scuttled for that purpose. Almost immediately after the sinking, the ship began to attract marine life from large groupers to schools of shimmering smaller fish and colorful tropical fish. Marine scientists expect natural corals to eventually envelop the Spiegel Grove. Workers prepare to install the mooring buoys that provide easy and safe tie-off points for boaters visiting the Spiegel Grove. The Spiegel Grove is so wide that on many days, the view of the super structure will fade into a green-blue abyss. On the clearest days, the sandy bottom will be visible at a depth of about 130 feet from the surface. 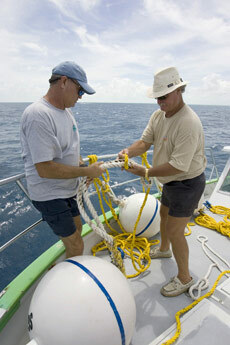 Mooring buoys provide convenient, coral-friendly boating tie-offs. From 1956 to its decommissioning in 1989, the Spiegel Grove helped enforce America's Cold War strategy of containment, which called for rushing troops and equipment to support friendly governments. The Spiegel Grove is well on its way to becoming an entire reef ecosystem. "If I had to use two words to describe it, I would say it's huge," said Gloria Teague, a sport-diving enthusiast in the Keys. A descent on the Spiegel Grove is not for the beginner diver, sport diving experts say. Gary Mace, president of the Upper Keys Dive and Snorkeling Operators Association, says he has specific guidelines that are communicated to his shop's customers that dive the Spiegel Grove or any artificial reef in the Keys. "For a normal dive on a wreck without penetration, we want people with advanced open water certification or higher," Mace said. "If divers just have open water certification, they should have their log books available to be reviewed for air management skills from previous dive history." Mace said for those intending on entering the upper decks of the Spiegel Grove, areas that were prepared to lessen the risk of such activity, divers must have knowledge and proof of certifications regarding diving in overhead environments. "Overhead environments are dangerous and without special instruction and knowledge they are not meant for the average diver," Mace said. "We tell divers there are areas on this ship not intended for access and for no reason should you be entering an opening below 90 feet, or below the main deck on the Spiegel Grove, even with advanced certifications."